After graduate school I moved from North Carolina to Pennsylvania. I searched around for gamers and found a cool gaming club called Philadelphia Area Gaming Enthusiasts (PAGE). The group was great – nearly every week we played a different RPG. It really opened my eyes to the diversity of games our hobby can offer. But my first game was the most mind-blowing. 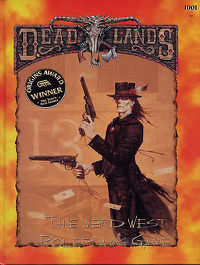 The game was Deadlands, and while it certainly has some great twists, what blew my mind was the DM. Del Padilla started us off by talking about the camera, panning down over red sandstone cliffs, rolling tumbleweeds, and a blood-red sunrise. I had never thought about talking about an actual camera (how anachronistic! ), but this cinematic montage WORKED! I visualized that scene in a really vivid way, and it led into a great session as he added details and thew us into the action. It’s a trick I’ve used often, for specific results. 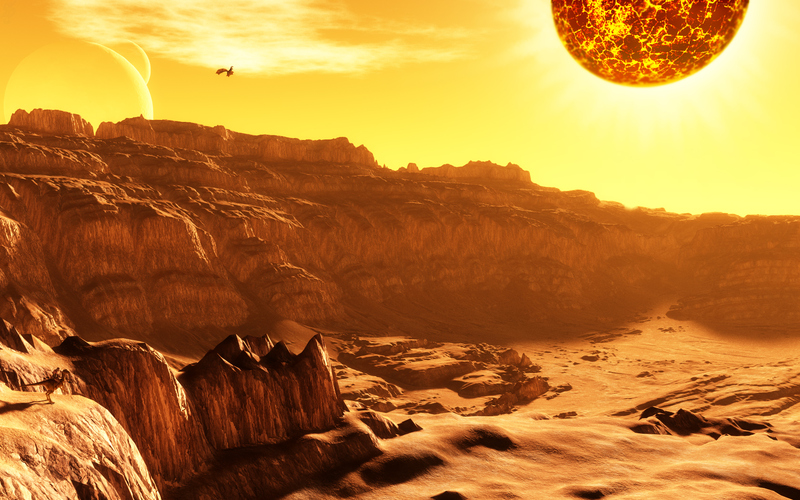 Scalding wind and sand rush past, burning your skin like the searing sun above. The wooden floor beneath your feet moves from one side to the other, then up and down, threatening to hurl you into the air. The heavy war chariot you follow, similar to the one you and your companions occupy, is barely visible ahead. Without warning a bolt of lightning sizzles outward from the enemy chariot. It strikes a tall column of stone, sending it crashing down towards you! The idea was to have the characters sit up in their chair and take notice, right from the start. Players should have questions… who is in the chariot we are chasing? Why are we chasing them? The adventure hit them with an important question to further get them going: which one of you is driving our chariot? When I ran this (all week long at Winter Fantasy 2011), I expanded the boxed text into a montage and used the camera panning down trick. I started with the rocky canyons terrain, the dust kicked up by the lead chariot… all quiet as if the sound was muted… then panning down and zooming in on your chariot, the sound kicking in with the team’s shouts, the crack of the whip, the wheels crushing the dry rocks underneath, the sizzle of lightning. It was a great way to inspire the players to think of this as a really cool movie, and to inspire them to think of playing like blockbuster heroes. The chase is full of scenes that beg for this kind of play, so the cinematic montage was a great way of getting them into that mindset. 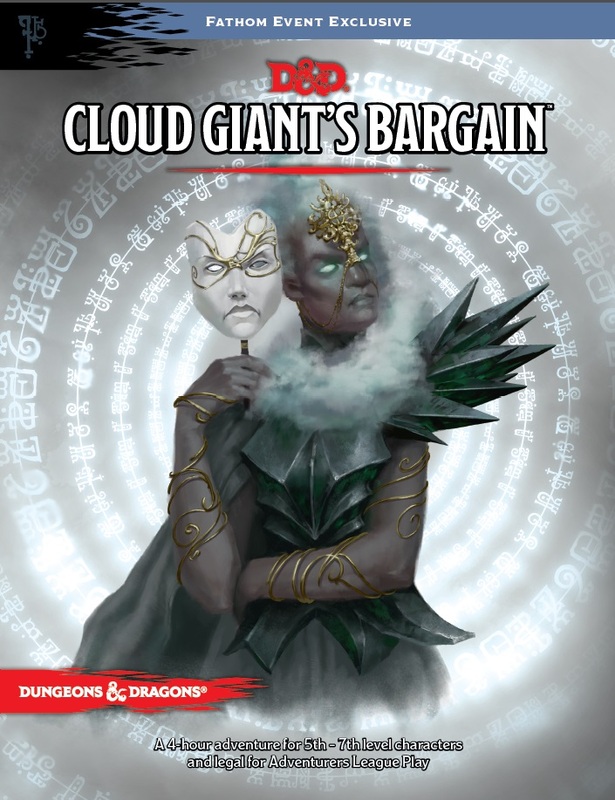 I was kindly invited to run the Acquisitions Inc adventure Cloud Giant’s Bargain for an Extra-Life fundraiser at an area gaming store. I had less time than I needed to run it comfortably. What to do? I turned the first encounter (a trial run by Acquisitions Inc., where they see how you do against thugs in an alleyway) into a cinematic montage. I told them a bit about the alley, giving them some things they could use: crates, refuse, a cat hissing from a rooftop, tall houses with laundry lines and porches. We went around the table, each character giving us their scene. It can often start slowly, as players get the hang of it, but quickly the players stepped up to the task and came up with some sweet scenes worthy of an eighty’s theme song! The scene took less than five minutes to run, still had the players laughing and smiling, and gave us the time we needed to run the rest of the adventure in our allotted time. Use this technique when you are pressed for time, but you have a scene you don’t want to skip entirely. This is a great technique for home campaigns, because we often end up sidetracked with some side quests but really want to get to a particular cliffhanger. In organized play, you can use this technique to close out a non-critical combat that is running long, or even to start one off, turning the first two rounds into the cinematic defeat of half the non-boss foes (perhaps each foe deals damage equal to one round worth of attacks, as if they missed half the time… adjust to taste). A cinematic montage can help explain the passing of time, skipping moments you don’t want to play through. Searching an area for traps, exploring empty rooms and corridors that have some interesting color/lore but nothing else, haggling with a merchant, traveling through the wilderness. Keith Baker once wrote about resolving a wilderness trek by asking each player to describe a challenge their character overcame, and how they did it. You can go a step further by asking them to create the cinematic scene, bringing a greater sense of action and drama to the tale. The Dungeon Master’s Guide discusses travel montages for wilderness travel on page 106. It has some great advice on how to be descriptive as a DM. Transition montages are a great way to bring travel to life. Make a list of cool features, then drop them into the montage. Think of Port Nyanzaru in Chult. As the party moves from one location in the city to another, you can describe a handler trying to get a muzzle back on their dinosaur mount without being bitten, the architecture and how the jungle constantly tries to grow over everything, the heat and humidity, the clothing Chultans wear, the different accents, the smell of foreign foods. You can call for checks too. I like doing it before the scene. 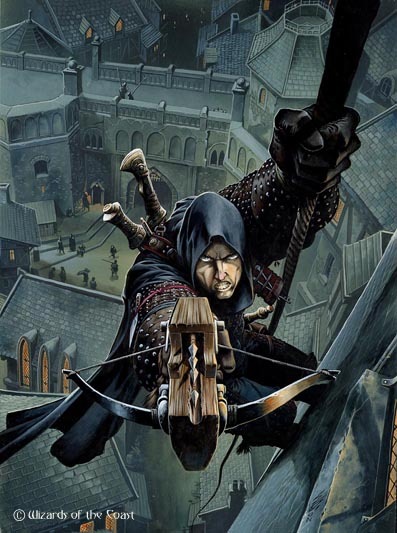 When a trap is going to just bore the party, I might ask the rogue to give me Investigation and Thieves’ Tools checks, and then use a cinematic montage to explain how they found (or didn’t) the traps and how they cleverly bypassed them (or not). In a montage you can dramatize, borrowing from the incredible traps in Indiana Jones or other movies. A montage speeds up play, but can also give everyone a mental break while reminding them that this game is full of exciting movie-level fun! Don’t overuse the technique, however. In the end, the players want agency. This is a tool in your toolbox to use from time to time, not something for every session. If you’ve watched the D&D episodes of the TV show Community, the DM at times runs outcomes like a script. It’s highly cinematic (and great for TV), but it robs the players of agency if the DM always runs the show. 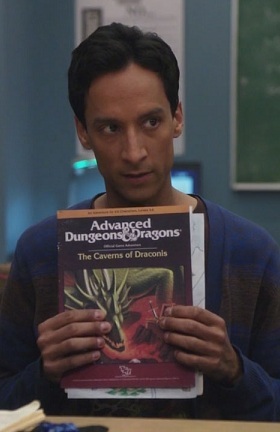 Learn how to be as descriptive as Abed (the DM in that show), but let the players drive the narrative. I didn’t do that this time. We worked together to identify the elements of the setting that interested us the most, but I didn’t ask players to define something linking their character to another, nor did I ask them to feed me details on how their backstory intersected with the campaign. The main reason was to make the PCs somewhat separate from the setting. 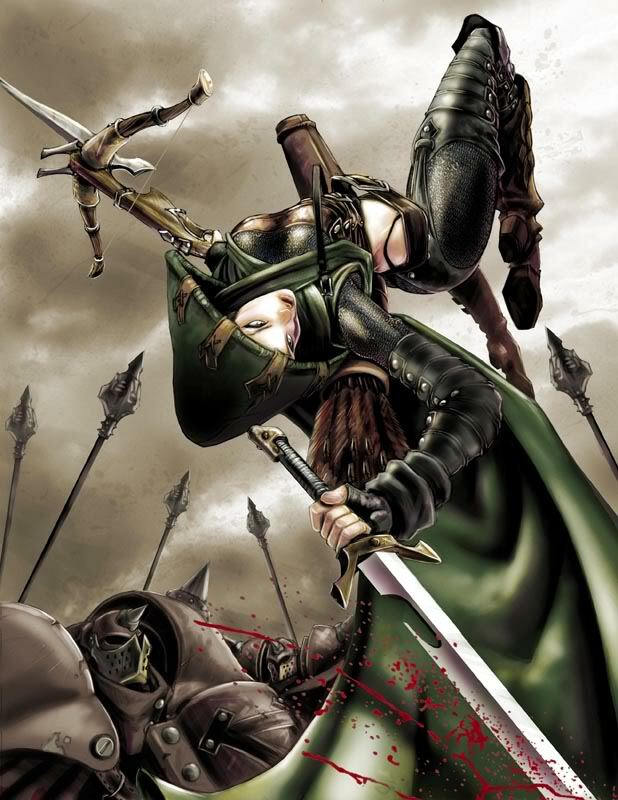 Many of them are foreigners to Chult, so techniques that tie setting elements to their character would go against that. Chult’s wilds and secrets are foreign even to the locals, making it less useful (even problematic) to set up such relationships. Strangers, in a strange land. Instead, for the first session I wanted to start with a cinematic montage. This provides a visual character introduction to the players and DM. Everyone “sees” what the player describes. It can be a very vivid moment, and often captures bits of character flavor that a regular character introduction might miss. Ever go around the table and have some introductions that are a bunch of statistics? (“My cleric wears chainmail. Oh, she’s a dwarf called Dagdra.”) A montage encourages a player to be more descriptive, actually helping them to vocalize how they see their character in their own head. In this ToA campaign, half of the party is from Chult and half is foreign. We ran two montages. First, aboard a ship headed for Chult. I set the scene with a description of the boat nearing Chult, describing Chult’s jungle-covered mountains from afar, then zooming back to the vessel as swarms of flying lizard-dinosaurs began to attack the rigging and crew. I then invited each player to give us a montage of how they helped take down some of the attackers, then end with their name and backround as it would be printed on the screen when their montage ended in a freeze-frame. One player made us laugh with his poor understanding of ships, as he used burning hands to burn both the flying lizards and the rigging, causing the captain to yell at him. Then his name came in: Leucis, Order of the Gauntlet Agent (with the concept that he often fails to live up to their expectations). Perfect! Our second montage was in the Thundering Lizard tavern in Port Nyanzaru. A fight was breaking out… how did the Chultan PCs handle it? They gave clever accounts of how they either defeated foes or avoided them, including some fun bits of lore (such as who was doing the fighting – Amnites and Baldur’s Gate expatriates). In just a few minutes, everyone had memorable introductions. Importantly, it felt as if we had already been playing D&D together! And, if you are looking for ways to bring both jungles and taverns to life, here is a product Eric Menge and I wrote together for the DMs Guild! We recently gave a sneak peak of the cover! What are those Batiri carrying? Hmm… find out in Jungle Treks! The Down With DnD podcast had an episode on Starting a Campaign and on Running a Session 0. Wizards of the Coast is again raising funds for Extra-Life and sick kids! They have launched the Tortle package containing rules for playing the turtle-like race, plus a wealth of setting information that can launch some fun adventures! It is valid for Adventurers League and already a Platinum seller! D&D staff Mike Meals and Chris Lindsay are giving out insane AL-legal character benefits. You can also give to support the DMs of games taking place the weekend of Nov 3rd-4th: Chris Perkins, Lauren Urban, Shawn Wood, and Encounter Roleplay. Greg Tito has a page here, listing the rewards, with download links as they unlock – get free stuff! The D&D Page here allows anyone to create a team and help kids! Free Adventurer’s League Guide to the Factions of Faerun. Free Adventurer’s League Content Catalog, listing every adventure published for AL! The excellent RPG setting Karthun is on sale for just $10! If you follow me on Twitter you know just how much fun I’m having with this world! Gale Force 9 announced a new Tomb of Annihilation DM screen with the gorgeous are and adventure-specific tables. I’m a sucker for collecting GM screens! 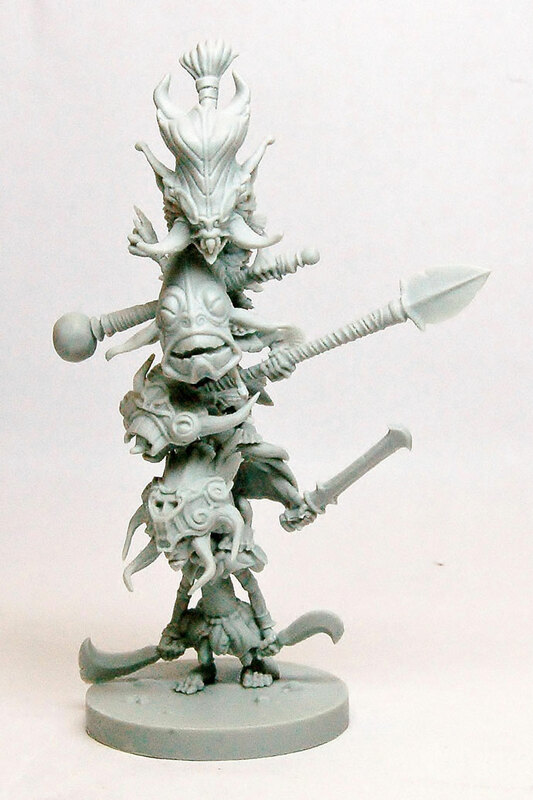 And, they have new ToA unpainted minis, including Ras Nsi (cool Yuan-Ti foe) a hero mounted on a dino (straight from an art piece) and the best… a Batiri goblin stack!!! Acererak will also be a mini. Great article. I am going to experiment with this in my game. Thank you. This description (and I’m sure in play was, as well) is so evocative. I love how you wind up bringing in a sense other than sight; the feeling of onrushing noise growing louder as the “camera” zooms in is an excellent touch, and one I’ll have to try myself. 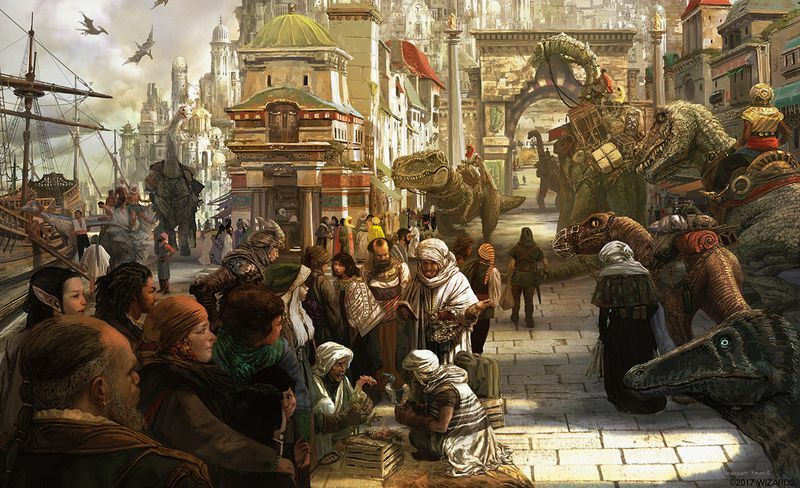 This entry was posted on September 27, 2017 by Alphastream and tagged 5E, Backstory, Conventions, Pace, Tomb of Annihilation.